Easton leaves behind the MAKO in 2018 and moves into the Ghost X series of bats. Like the MAKO these are two piece composite bats built with a light swing a big barrel. They will serve the same population of hitters that need/want as much barrel as possible on a smooth swinging stick. I have seen the Easton Ghost X and used it and now I write our 2018 Easton Ghost X Review. Where to buy the Easton Ghost X? Easton’s Ghost X will come in several different sizes. I list them below in the bullet points. The 2018 brand of bats will be offered in the most robust offering of any bat line in 2018. Expect to see the bat in a BBCOR from sizes 30 to 34 as well as a number of USSSA bats including a drop 5, drop 8 and drop 10. As well, the new USAbat will be an interesting take as Easton is set to release atleast one line of 2 5/8 drop 10 USAbats. As the most popular overall bat made in the world, you can expect Easton’s premier bat line to be useful for most types of hitters. The only ones I would suggest do not use the Easton Ghost X are those who like single piece bats, those who want something that is more stiff, those who like hot out of the wrapper aluminum or those who do not like two piece bats. Otherwise, you can expect the following characteristics in players that should really appreciate the great smash of the 2018 Easton Ghost. Like a bat that feels good even on poor contact. Use a bat where every hit feels like a homerun. Is looking for a USAbat. If the Easton Ghost X struggles in any department I expect it to be durability. Not because the bat is poorly made. On the contrary, the bat is one of the best two piece composites on the market. But, instead, because two piece composite bats have a lot of chances to break. That is, they can become dysfunctional on the connective piece, the barrel, the end cap or the handle. Each, although separate crafted well, have more points of structure that might break. It is the nature of two piece composite bats. As such, I suggest you buy these bats places that offer a real warranty and a real receipt. Although the entire line of bats, and each of the models, are hard to stuff into one category of performance, I think the Easton Ghost X will be one of the best performing bats on the market for 2018. No doubt about it. Expect the best from these bats because it is likely you will get it regardless of what model size you purchase. The Easton Ghost X will come in just about every size imaginable. I’d like to see some additional drops added to the USAbat space (instead of just the drop 10) but I can’t have everything. Hence the reason this rating gets a 99/100 instead of a 100/100. Although it is early, my preliminary testing and reading others thoughts make this 2018 Easton Ghost X on the short list of great bats. I fully expect this bat to be as loved in the BBCOR, Big Barrel and USAbat space as the Mako’s that preceded it. As of this writing, the overall ranking of the Ghost X is as high as I have given any bat. Much can change throughout the 2018 season, no doubt. But, for now, I think this bat is going to do be dynamite. 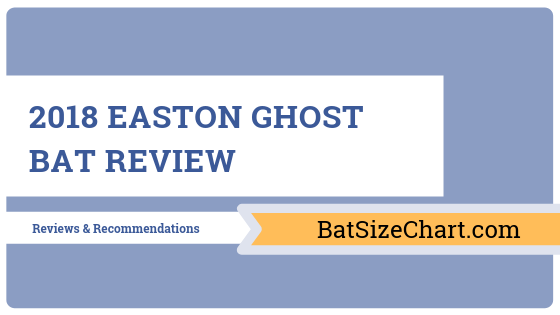 If you are looking for places to read more about the Easton Ghost X I would suggest the 2018 bat section directly on Easton’s website. There you will find all the up to date sizing options as well as MSRP pricing options. Good luck and happy hitting! Louisville Slugger’s 618 Solo is the most popular baseball bat in 2018. This came about due to a perfect storm of factors. They included the fact the bat was reasonably priced, came in a huge array of sizes, swung light and delivered on a USA Bat version that took the market by storm. In short, the bat fit exactly what the market needed. Reviews on the bat are fantastic across the board. There is a reason it sits atop the best BBCOR and best youth bats list. Some notes, we add, here. As always, the best place to find a 618 Solo for a good price is on eBay. You can find both new and used Solos there. Many big time vendors actually release much of their overstock on eBay. As we get closer to 2019 bats you will see the price on the 618 Solo drop even more. You can always check directly on Slugger’s site too. The major differences between the 617 and 618 Solos is the addition of a USA and USSSA (Big Barrel) versions of the bats. Otherwise, the bats constructions are nearly identical from 2017 to 2018. Sizing wise, the BBCOR version came in a short 29 inch up through a 34 inch in 2017. That stayed the case with the 2018 version. It was also very helpful the bat added a USA and USSSA version in a HUGE sizing range. Both bats use the same Lizard Skin grip, extended composite end cap and aluminum barrel. Single piece aluminum bats with an extended composite end caps are not uncommon. In fact, the Rawlings VELO has made that construction design popular for several years. Removing weight from the end cap (by replacing its aluminum with a plastic/composite) helps drive the swing weight down. But, the aluminum barrel allows for a strong feeling at contact, great sound on impact and greater durability. This design is the halmark of the 618 Solo and, to say the least, has really caught on. The star of the 2018 show for the 618 Solo line is the USA Bat version. The bat came late to the party. But, when it arrived, the need for a truly light swinging and durable bat in the USA Space is EXACTLY what the doctor ordered. The USA Version ran a drop 11 with sizes as short as a 28 and as long as a 32. 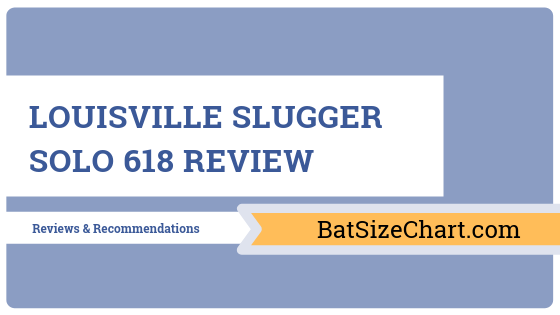 There are considerable differences between the 618 Solo and 718 Select from Slugger. For starters, the bat’s focus on a light swing (618) and an end loaded swing (718). Second, one bat uses a single piece design (618) while the other uses a two piece hybrid design (718). The 618 has a stiff feel on contact while the 718 feels more forgiving. The two bats also come in different drops in the USA. The USA for the 618 is a drop 11 while the 718 has a drop 10 and drop 5. The USSSA both have a drop 10 while the BBCOR is, obviously, a drop 3. The bats are made for different types of hitters. Smaller or base hitter types will like the 618 for its light swing and big barrel. Stronger or home run type hitters will like the 718 for its heavier end weight. As an example, college players tend to prefer the 718 for its end weight. Highschool players would prefer the 618 Solo. The 2018 DeMarini CF Zen in BBCOR is a monster bat. I love the smash on hits and mishits alike. The two piece design and the new 3 fusion handle are well made. It is no suprise this is DeMarini’s most expensive bat. the marketplace for as long as I can remember. I know a good bat when I see one, and I can almost always feel the strength of the grip of any of the bats out there. That, plus a ton of research on these little gems makes me a real baseball bat connoisseur. 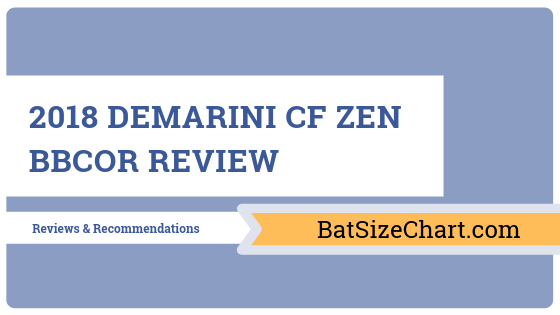 This piece is going to be a review of the 2018 DeMarini CF Zen in BBCOR, and you are going to love it. most ideal in the hands of a contact hitter, it still has enough power in it to accommodate the whims of a power hitter. However, if you are looking for a little more of an end load, then the advice would be to look elsewhere. The 2018 CF Zen is made for competitive players from high school all the way to the highest ranked professional leagues. With this model, DeMarini has used its popular ParaFlex material to build the barrel. This material makes for a good swing and power. In addition to that, it is sturdy and won’t break midway through practice. The long barrel gives you an opportunity to add power to your swing and connect with the ball more often, which makes for plenty of power shots. In addition to a good, balanced design with a good grip, the Zen also comes with a new feature, the 3Fusion handle that works towards eliminating sting and vibrations when the hitter makes an unbalanced swing. Less sting means a higher level of accuracy and hence better performance. The handle is quite rigid, and this provides some good flex, especially when in the hands of a power hitter. The 2017 model of the Zen didn’t come with the 3Fusion handle, and that was a real problem because it used to sort of spin out of form and ruin what would otherwise be some very good swings. The lack of this type of handle did little to help with problems related to sting and vibration, and while it was a good bat by any standards, it couldn’t scale the dizzying heights of performance the 2018 version is capable of. The new bat also comes with a longer barrel, and any hitter will tell you what kind of contact that provision makes for. For DeMarini, high performance bats have always been part of the job description, and this bat is an upgrade of most of those varieties. CF Zen has some similarities with its predecessors such CF7, CF8 and CF9. Sure , a good number of things have changed, such as the level of precision expected as well as the materials used to make the various components. However, the operation technique has not changed much, and there is a consistent focus on ease of use and tact. CF Zen’s sister version for 2018, the CF Insane, is also a lot like others in its pool but has a modified end load, making it ideal for power hitters. a $50+ shipping fee, so amazon is definitely the better deal at the moment. Although I do not know too much about the Easton GHOST bat, since it is only released in fastpitch as of the time we publish this article, we do know that Easton will be releasing a Ghost in baseball too. The bat will replace the Easton MAKO as the flagship bat in Easton’s line. And, we can only imagine, the bat will use the upgraded connective piece and some degree of a double barrel like the fastpitch versions. The ghost fastpitch bat is going to be a rockstar. Although we do not think it will be as dominate as the XENO or CFX from slugger and DeMarini respectively, I do think it is laying the ground work to compete in that long barreled and light swinging 2 piece fastpitch bat space. At this moment, I am not sure exactly what the BBCOR Ghost looks like. Although, I should note, we have seen some close up pictures of the material. It does look like it will have that same interesting composite structure within the barrel. In terms of what it will feel like, we could guess they will do their best to make it swing at least a little bit like the MAKO. The MAKO had a great swing weight and many players were really attracted to that. If the 2018 Easton Ghost bat makes our Best BBCOR bats page is yet to be seen. Best Prices for the Easton Ghost will be on eBay! We can also only assume that Easton will be releasing a Ghost bat in a new USAbat bat too. Total performance for these bats should be lackluster at best. But, if there is anything I am more excited about, it is getting the new USAbat bats in house and checking them out. Where I feel like Easton could really make up some ground is in the Big Barrel baseballb at space. Although the MAKO Beast was a really good bat, it was not quite as good as the CF8. Granted, the CF8 was made illegal. So any bat looked like a dud compared to that. But, most travel ball players are convinced the CF line has mastered the big barrel world. If the Easton Ghost in a big barrel can do that we will wait and see. Marucci has made a CAT baseball bat for the last several years. The CAT 5 was the first iteration followed by the CAT 5-squared (after the CAT 5 was made illegal in a few leagues). Then followed the CAT 6 in 2014 and then, now, the CAT 7 in 2017 and 2018. Below discusses our 2018 Marucci CAT 7 Review. Where to buy the Marucci CAT 7? The CAT 7 is Marucci’s most elite bat. It comes in many different sizes and, really, there is a size for everyone. I really like the drop 5 and drop 8 in the big barrel. Here are a list of the sizes you can find. Marucci releases their premier CAT line on a two year cycle. Meaning, the 2018 and the 2017 CAT 7 are exactly the same. If things go to form, expect a 2019 CAT 8 (or something like that. They did make some upgraded bat designs in 2018 with the CAT 7 chassis. The first is a black camo looking bat and the second is a CAt 7 that looks like a Buster Posey wood bat. The CAT 7 is a single piece bat built for maximum power transfer to the ball. That is, the stiff structure of a single piece bat has no give at contact like two piece bats. The disadvantage of a single piece bat is that they tend to ring your hands on mishits. Marucci solves this problem by adding an anti-vibration knob in the knob to help dampen sting. Like a Balanced, but not necessarily light, swing. Prefer a stiff feeling bat. Want Max performance and a big barrel for a more reasonable price. As a single piece aluminum bat the durability of the Marucci CAT 7 is tough to beat. The only issue you might run into is the knob which has its own insert, but that was more a problem on older models of the CAT. As well, the CAT 7 does use a very thin aluminum in the barrel. But I have never seen a dented one. It appears to hold its shape well and it is a very durable bat. If the Marucci CAT 7 struggles anywhere it is the lack of sizing. I would love to see a 2 5/8 drop 10 as well as some options in the USAbat bat arena. We do like the upgraded looks of the buster posey model and the black camo design, but the lack of sizing in those models leaves more than a few hitters dissapoitned—relegated to the 2107 CAT 7 look. 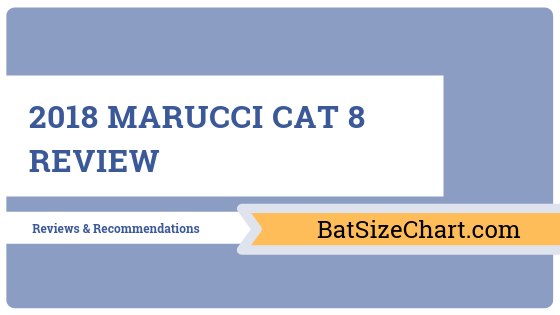 As we mention above, the Marucci CAT 7 User ratings are fantastic. If you are in the market for a light swinging BBCOR or big barrel bat that has tremendous pop and some decent feedback then look no further. Real hitters, including me, love the bat. The 2018 CAT 7 is one of our favorite bats in the class. The fact the price point is a little more reasonable compared to other brands top shelf bat is a major plus. I am very high on this bat and recommend it to anyone who is looking for a great value purchase. If you’d like more information on the CAT 7 you may find our 2015 CAT 6 review worth your while too. There was an upgrade of a thinner aluminum for a larger barrel. Also, Marucci’s site is usually worth a look too. There I could find a number of different sizing options as well as what colors were in stock. 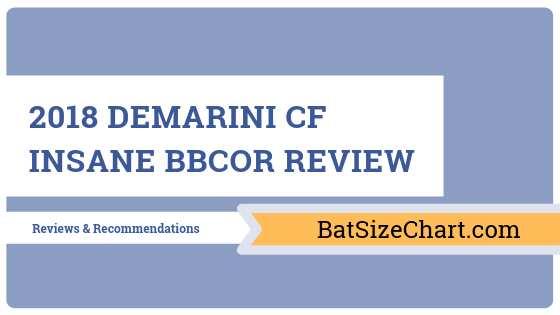 The 2018 DeMarini CF Insane BBCOR is a high quality baseball bat built for players looking for speed and superior handling at the field. The bat is made from 2-piece composites constructed with a top grade composite barrel and handle. These two parts are joined together with an attachment piece known as the 3 Fusion, which is probably the most impressive feature of this year’s series of bats. 3 Fusion has removed excessive weight from the connective unit, thus allowing you to have better control of the equipment. Furthermore, the bat’s point of balance is found lower down the barrel and this provides more power at contact compared to other brands, assuming that the swing weight remains constant while playing. The BBCOR’s streamlined body allows you to make transitions smoothly without putting too much effort. The bat’s end loaded balance provides greater mass at impact. It’s a BBCOR certified bat meaning it can be used in Highschool and Collegiate Play. Equipped with Paraflex barrel material which makes it feel lighter than it actually is. This material allows you to enjoy tremendous hitting performance right after purchasing your 2018 DeMarini CF Insane BBCOR from the store, you don’t have to break it in before use like other baseball bats. In other words, you can take it right from the shelf to your upcoming game without doing any prior adjustments. Moreover, the barrel on Insane BBCOR has slightly been extended from the previous model, so as to give you a longer focus point or sweet spot for making ball contact more often. As for player type, it’s an endloaded bat that normally does well for power hitters. However, the bat still has sufficient balance as to find a home in contact hitter’s hands too. Those looking for a little bit extra power with sufficient end load will find it quite appropriate. The 2018 DeMarini CF Insane Endlaoded BBCOR is one of the most advanced baseball bats the company has ever created for younger players. Though it can be used by any player interested in a good bat, it’s usually reserved for competitive players at high school or much older levels. According to the manufacturers, 2018 CF Insane BBCOR is an end loaded composite stick in their collection. The bat is perfect for you if you’re in need of speed through the field zone, or skipping into the BBCOR game. It will help you upgrade your game and performance instantly. The 2018 DeMarini BBCOR is an advanced baseball bat that continues on the great legacy of superior quality already paved by its predecessors. 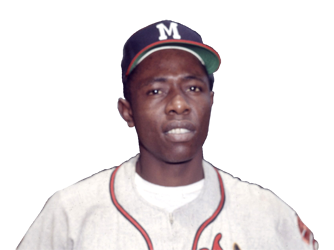 A lot of technology went into creating this model so that it can be suitable for use by its target group, mainly consisting of competitive high school and college baseball players. One of its most significant features is the connective piece which eliminates vibration from the handlebar, and also stinging. This ultimately gives you greater confidence and feel at the pitch. Furthermore, the 2018 DeMarini BBCOR has a less bulky construction compared to its competitors, which allows for more accurate dial in swing-weight throughout the bat. This product will make a great tool for players interested in upgrading their game. Louisville Slugger will release a 2018 two piece composite bat called the 918 Prime. The bat uses the same connective TRU3 technology as it did in previous years, but now ends a new end cap and a new composite for a bigger barrel and a lighter swing. It will be priced out at $399. But, I always like to look at ebay pricing before anywhere else. Where to buy the 918 Prime? 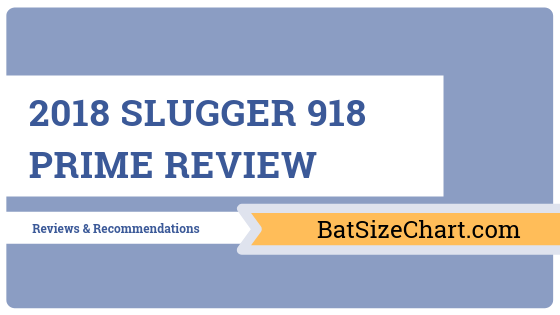 The 918 Prime will be Slugger’s most robust baseball bat. Meaning, the bat will come in the most sizes of any of the 4 major performance bats Slugger will produce for 2018. You can expect a BBCOR, USABat as well as several big barrel bats in the drop 5, drop 8, drop 10 and drop 12 range. What the drops will be in the USABat bat range have yet to be seen. Although there are some structural changes to the 918 Prime, when compared to the 917 Prime from 2017, the bat will still be intended for the same audience. More specifically, the following characteristics are the type of person that will like the 918 Prime. If the 917 struggled in any particilar category it was the durability. There were more than a couple of reports that the connective piece between the handle and barrel would become loose. And, upon hitting the bat, you could feel the barrel spin away from the barrel. No one denies the 918 Prime is a beautifully performing baseball bat. In particular, many BBCOR hitters love the use of a 918 at high levels of highschool and collegiate play. Although the barrel could have been bigger in the 917 Prime, the 918 solves at least a few of those issues with the new end cap, new composite and ultimately bigger barrel. The 918 Prime gets almost perfect marks on the 918. The bat is Slugger’s marquee bat. It comes in a BBCOR, USAbat and then several Big Barrel sizes. We would love to see a drop 10 in a 2 3/4 too. And the fact it only has one size in a USAbat keep it from getting the perfect score. Although still very early in the season, early reports show the 918 prime as a very user friendly bat. It is a smooth swing even on the most violent smashes. Every hit will feel like a home run as the two piece composite makes them all feel great. And, a hit right in the sweet spot with some good bat speed should make that ball sail. There is no doubt that the 2018 Louisville Slugger 918 Prime will be a marquee bat in the baseball space this year. The BBCOR bat should be the most popular with the big barrel and senior bats not far behind. The jury is still out on the USAbat PRIME 918. Since this blog covers bats before just about anyone else, there is not a lot of information on the 918 prime available to date. We always suggest you check on Slugger’s site directly. Otherwise, check back here often for updates. Our overall BBCOR bat reviews page is super helpful in your search for a great baseball bat. We have spent considerable time with the Easton MAKO line of bats over the years. In fact, since the Mako’s original release in 2014 we have ever single make bat on the market. That includes the famed 2014 orange version as well as the most reason Easton MAKO Beast. 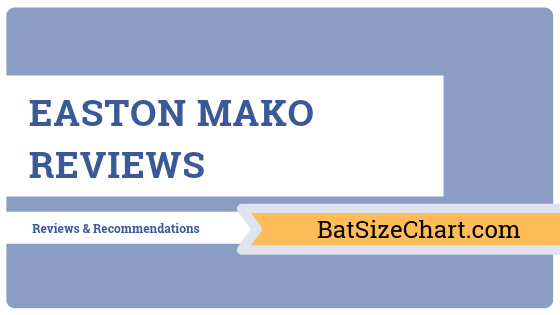 No bat, dare we say, has had more impact on the industry at large then the Easton Mako. It has consistently ranked on the top of many best youth baseball bats lists. 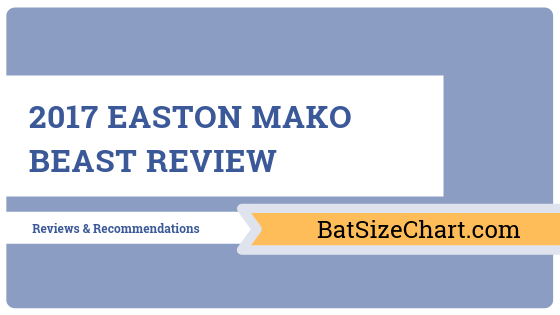 Here we review each of the Easton Mako bats and detail their progression over the years. This serves a true Easton Mako review. The 2017 Easton MAKO beast is the culmination of 4 years of R&D in the MAKO. The barrel is larger than ever. The swing weight is a bit heavier than the 2016 versions. But, still, it is a two piece composite bat built with a balanced swing weight and the ability to absolutely rake balls. Few players who use the Beast ever go to anything else. The MAKO Beast comes in a number of sizes and model types. At the top of the popularity list is the BBCOR model. We discuss this more in our most popular bats article. Then follows the 2 1/4 Little League bats that are the top of their class. Next is the large grouping of senior league and big barrel bats that range from a 2 5/8 drop 5 to a 2 3/4 drop 12. The Easton Beast really does offer a bat type for every hitter. One complaint that many get when deciding on the Easton Mako is its price point. Never has the Mako been considered inexpensive and rarely can you find one on a closeout type deal where the prices are exciting for the consumer. Instead, almost always, it takes some effort to convince yourself to pull the trigger. But, year after year and season after season people keep coming back. Although no distributor or outlet is selling the 2017 MAKO Torq, you can still find them directly on Easton’s site. These 2017 TORQs are, as far as we can tell, left overs from previous years that went unsold. With such a massive inventory, Easton has repainted these bats and is now selling them on their site. We would guess this may very well be the last year of the Mako Torq. On the whole, the bat’s barrel and performance are top shelf stuff. But, the spinning handle has struggled to find any real uptake among serious players. It is still considered a gimick by most. We are fans of the bat and the idea, but we are well in the minority here. The 2017 Easton MAKO Torq is a two piece composite built on the same chassis as the Easton MAKO Beast. It comes in the full breadth of sizes the Beast does too. If you were to tape down the handle, and not allow it to spin, then the TORQ and the Beast would be identical bats. The most popular of the 2016 line of bats, the Easton MAKO is considered by many the best MAKO ever. The swing weight is lighter than any version before or since. Although the barrel is smaller than the Beast, the 2016 Easton Mako deserves all the credit in the world for producing one of the lightest swinging bats with the one of the largest barrels. Few have anything to say but great things about the 2016 Mako. You could find a 2016 Easton MAKO in just about any size imaginable. The most popular version was the BBCOR version. 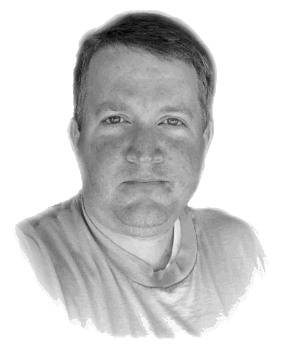 But, like clockwork for Easton, the Youth 2 1/4 barrel was, during the 2016 season, wildly popular. And, of course, the drop 5, drop 8 and drop 10 senior barrel bats were one of the most popular bats in that niche too. There really is not a bad thing we can think of to say about the 2016 MAKO. It is for hitters that love a two piece composite and would like a light swinging bat. The 2016 TORQ bats are left overs that did not sell from the 2015 line. Infact, they still have so many 2016 TORQs that they bled into the 2017 year as well. To put it nicely, the Easton TORQ was a colossal failure in terms of market acceptance. From a pure clinical standpoint, the TORQ is a good to great bat with a fantastic barrel and a massive sweet spot. The swing weight is right where folks want it. But, in the end, the spinning handle, and the premium price for the spinning handle, was too much to handle for parents and players. This bat, and the 2015 version, may go down as the biggest bat flop in history. Easton expanded the 2015 line of MAKO bats by adding an XL Version. The XL, as you might guess, is a more endloaded version of the MAKO. As Easton lowered the swing weight of the MAKO from the 2015 version, they felt obligated to still ad an iteration for the hitter that liked a two piece composite but still wanted some oomph. The bat was only offered in BBCOR and left those big hitting 14U players out in the cold. We are big fans of the 2017 Easton MAKO XL. For those that like a little more end load but still want that smooth smash of a two piece composite bat then this bad boy is money. Although not the most ubiquitous bat in terms of market demand, the people this bat served it served very well. The second year of the Easton MAKO was outstanding. Although there were no significant upgrades from the 2014 version of the bat the word was out. The MAKO was the king of the hill, especially in the Youth barrel space, and no one came close to catching them. Easton offered the 2015 Mako in a number of iterations including the very famous BBCOR, lights out big barrels and market dominating 2 1/4 barrel youth bats. Also in 2015, Easton released the bat that would get more publicity than any other bat ever has. The 2015 Easton MAKO Torq used a spinning bottom hand handle. The idea was to increase bat speed by allowing a hitters hands to rotate more quickly through the hitting zone. As hands could move independent of each other, at least in theory, inside pitches could be more easily raked. In nice terms, the bat was an utter failure in the market. We contend it had less to do with the technology then it did with the price point. Easton had previously pushed the envelope with the most expensive bat in the 2014 MAKO, and then added another $50 to the MAKO TORQ. Parents, already reeling from sticker shock on the MAKO dry heaved at the price of the TORQ. It turned into a rich bat for a kid that didn’t have anything else going for him and, in the end, sales were abysmal. In fact, sales were so bad that Easton still sells this very bat in 2017. These are not newly produced bats but, rather, repainted bats from this very season. Easton’s MAKO TORQ for 2015 was released in every size imagainable including a 2 5/8 drop 8 and drop 10 as well as the dominate youth barrel and BBCOR sizes. Today you can find these bats, still highly discounted. They are, in large measure, the same bat as MAKO but at a serious discount. If you are willing to tape down the handle then you could get a MAKO at a very cheap price. Ahhh, the bat that started it all. After composite bats were banned universally across baseball leagues a new standard of BPF 1.15 was implemented. Easton was so far ahead of the curve on producing a monster 1.15 BPF bat that few others in the space were even in the same category. The word got out quick that the MAKO was the bat of all bats. From what we have been told, the 2014 Easton MAKO was the best selling baseball bat of all time. Vendors could not keep them on the shelves. Even today the bat drives a premium price. The 2014 MAKO came in a lot of sizes too. The BBCOR and Senior League 2 5/8 bats were impressive. But the 2 1/4 youth little league bat may have been the most dominant bat in any category of baseball since Slugger dominated the wood and pro market in the early 1900’s.